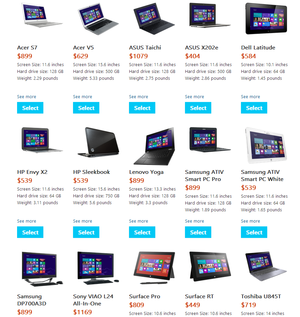 Do you want a nifty new Windows PC to help you pound out homework, but can’t afford the cost of a touchscreen device? 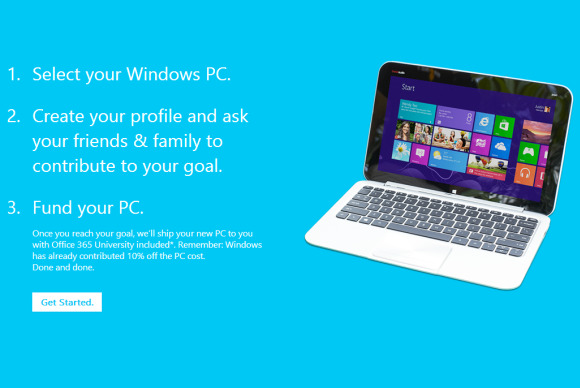 Microsoft has the solution: Bug your friends and family! 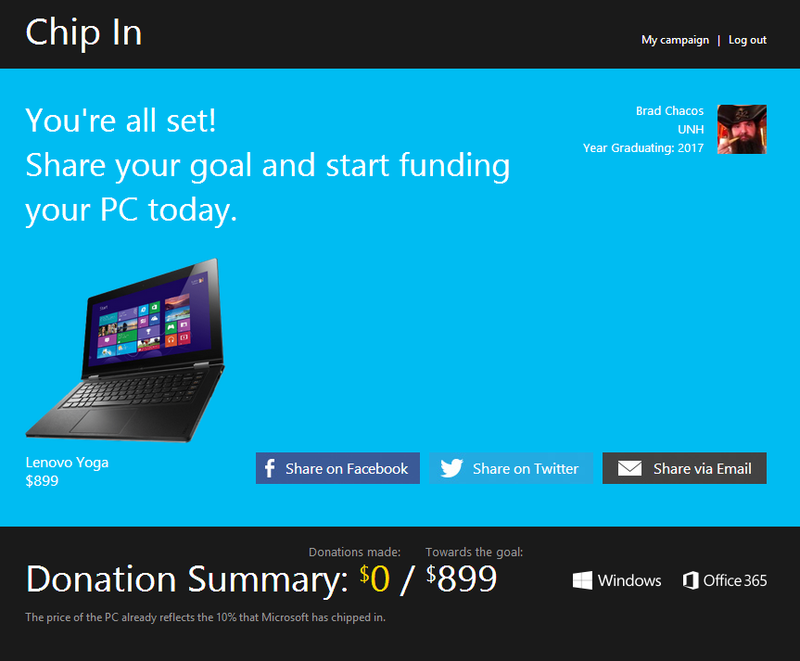 Microsoft’s bizarre new ChipIn service is designed to help you “crowdsource your new Windows PC for college.” To get the giving off on the right foot, the company’s tossing in a 10 percent discount off the top and preinstalling a copy of Office 365 University. After choosing a discounted device from 15 Windows 8 tablets, hybrids, all-in-ones, and laptops, ChipIn prompts you to sign in to Facebook, and then fill out a full profile with all your personal details. Be careful while you’re selecting a PC. ChipIn’s fine print notes that Windows RT devices—currently limited to the Surface RT—won’t run Office 365 University. Windows RT devices do, however, ship with Office Home & Student RT, which will meet your basic productivity needs but lacks the free updates, multi-device license, and online features found in the subscription Office. Once all the digital paperwork is squared away, you’re left staring at your campaign dashboard, where you can “crowdsource” your needed funds via Facebook, Twitter, or direct email. Contributors can pledge donations using a credit or debit card; while a purchase authorization is put on the card right away, your loved ones aren’t actually charged until you reach your funding goal. ChipIn’s closing up shop on September 1. If you fail to hit your funding needs before then, any contributions you did receive will be returned—unless those contributions total $499 or more. 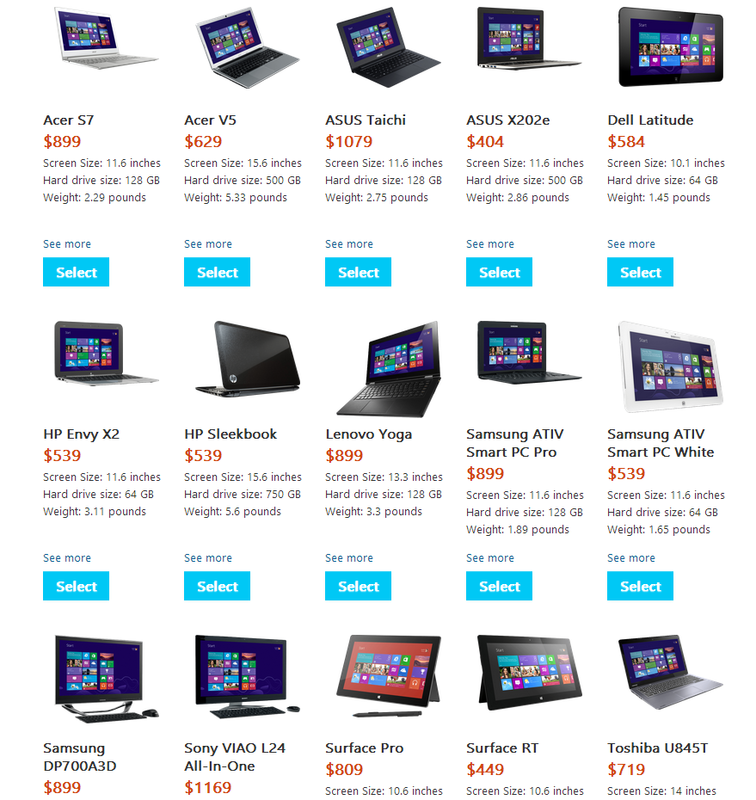 If you hit that milestone, you can pick a cheaper Windows device like the Surface RT, or you can chip in the extra cash towards your desired PC. While crowdsourcing is all the rage these days, it’ll be interesting to see if ChipIn takes off in any meaningful way. The timing is certainly right: PCs and Windows tablets alike are on a cool streak right now, while high school graduation—the perfect time to plea for college-related donations—is just around the corner. Act fast if you’re interested in the Office 365 University subscription, though. That offer’s limited to the first 10,000 fully funded scholars.